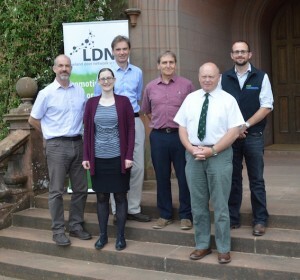 A gathering of 20 deer managers took place at Raehills Estate, courtesy of Lord David Johnstone, on Tuesday 12 June to discuss the issue of deer vehicle collisions and possible steps and mitigation measures that can be put in place to reduce numbers of road traffic accidents with deer. There are currently an estimated 8,000 to 14,000 deer vehicle collisions in Scotland each year of which 70 result in human injury according to Dr Jochen Langbein of Langbein Wildlife, the UK deer vehicle collision expert. Pictured before the start of the morning seminar are the speakers (left to right): Angus Corby, Transport Scotland; Isla Davidson, Scotland TranServ; Lord David Johnstone, Raehills Estate, and Chairman Scottish Land and Estates who hosted the meeting; Jochen Langbein; Maitland Rankin, Chairman, Galloway and Dumfriesshire Deer Group; and Jamie Hammond, Scottish Natural Heritage. The event was organised by the Lowland Deer Network Scotland, Scottish Land and Estates, Transport Scotland, and the Galloway and Dumfriesshire Deer Group.